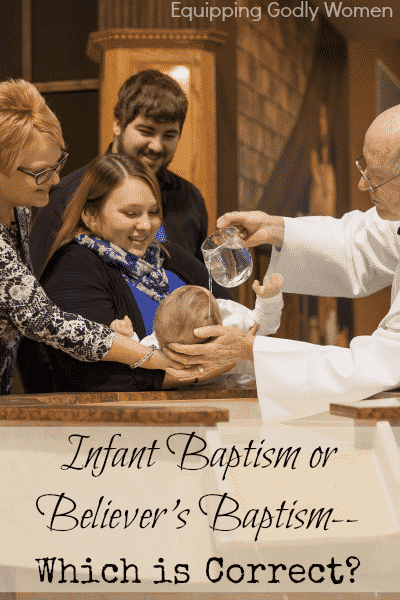 Infant Baptism or Believer's Baptism: Which is Correct? Infant Baptism or Believer’s Baptism: Which is Correct? 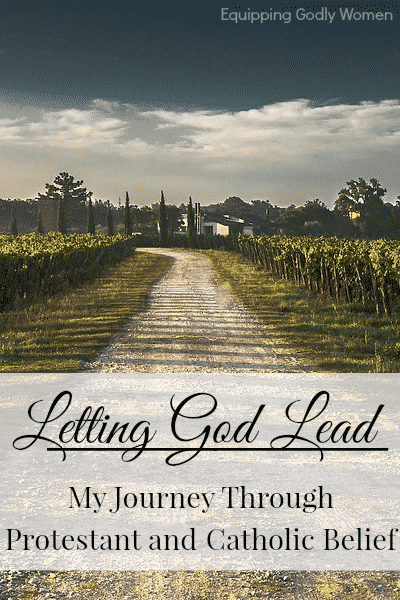 This post is post 9 in a series entitled Letting God Lead: My Journey Through Protestant and Catholic Beliefs. While you certainly can read this post by itself, I highly encourage you to check out the rest of the series as well. Find more about this series and a list of all of posts here. *This post contains affiliate links. When my oldest son was born, my husband and I had a decision to make: Would we baptize him as an infant or wait? My husband was baptized as an infant in the Catholic Church we still attend today. I was baptized in 4th grade at the church my family happened to be attending at that time. Which one was correct? Both Catholics and Protestants see baptism as very important, and yet the two groups (and various subsets within the groups) differ on details such as when a person should be baptized, how a person should be baptized and what baptism does, exactly. Hopefully this post will shed some light on the various positions. B.C: Baptism was around before the beginnings of Christianity. It is not a Christian invention. Bible Times: There is some question about whether or not the Bible mentions infant baptism. It does say “households” were baptized, but there is disagreement as to whether or not this would include infants. 220 A.D: The oldest explicit account of infant baptism we have today is by Tertullian around 220 A.D. Early Church – First Few Centuries: At first, adult baptism was the norm, as Christianity was so new that most people converted into it, rather than were born into it. Adults were required to convert before they could be baptized. However, both infant and adult baptisms were practiced, and everyone pretty much got along and didn’t worry about it too much. Both methods were acceptable and people were pretty much free to choose. **Interesting Fact: In the earliest years, new believers were baptized immediately upon conversion. But by the second century, the church began delaying baptisms until after the new convert had completed a “training period” where they would learn the church’s beliefs. Early Church Fathers: Not a single church father found infant baptism unlawful, though of course, everyone had their own opinion on when the “optimal” time to be baptized would be. There was never any serious controversy surrounding it until the 16th century. 253 A.D: The Council of Carthage condemned the practice of withholding baptism from infants until the eighth day, and infant baptism became the new norm. It was practiced nearly universally until the 16th century. 416 A.D: Infant baptism was made compulsory by Roman Law. If a person was re-baptized later, both the person and the person who baptized him/her could be put to death. 16th Century: During the Protestant Reformation, some Protestant groups (most notably the Anabaptists) began to question whether infant baptism was actually Biblical. They began “re-baptizing” (hence the name “Anabaptist–which means “baptize again”). Not all Protestants switched sides however. Some Protestant groups (including Lutherans, Presbyterians and Methodists) maintained the practice of infant baptism. **Interesting Fact: Martin Luther, leader of the Protestant Reformation, believed that baptism was more than a symbol. He believed that it offers forgiveness from sins and grants eternal salvation. Now, understand that opinions vary greatly; there is no “official” Protestant belief. This is not meant to address every single denomination. But since I grew up in the Baptist church, this series is about my journey, and Baptists and Catholics are nearly polar opposites when it comes to Baptism, that’s the perspective I’m sharing. Feel free to share your own experiences in the comments section! I’d love to hear them! People should be baptized of their own free will. They must be old enough to understand what baptism is and what it means. They must make a confession of faith. Classes may or may not be required. The purpose of baptism is to make a public profession of faith (though it doesn’t really have to be public). Baptism is a rich symbol, but it’s just a symbol. It doesn’t necessarily “do” anything. Who: Anyone who believes and is old enough to want to (see requirements above). Baptisms are typically done by the pastor. Where: Many churches have a baptismal font right behind the stage, which is accessed from behind. People also have the option of getting baptized in a river, pond, lake, etc., which usually happens during special church camps or events. When: Some churches keep the water warm to baptize anyone who wants to come forward and “accept Jesus” at the end of the service on any given Sunday. Others will wait and have a baptismal service where they baptize several people at a time. People are baptized by full immersion to symbolize Jesus’s death, burial and resurrection. The pastor will generally give a short introduction and the person will probably share their testimony. The pastor will ask the person some “Do you believe” type questions to make sure the person is a believing Christian. Much applause and rejoicing from everyone watching! For infants: In denominations that don’t baptize infants, they often have a baby dedication ceremony instead. Basically, the mother and father bring the baby (up to age 2 or so) in front of the church, they promise to raise the baby in the faith, the church promises to do everything in their power to help, and the pastor says a prayer that the baby will grow up to know God. Baptism is important because it removes the stain of original sin (and because the Bible commands it). Infants should be baptized as soon as possible, as their salvation depends on it. You are never too old or too young to be baptized. Similarly to how Protestants added baby dedications, Catholics added confirmation, in which a Catholic young person makes their official profession of faith. Baptisms done in other Christian churches are still considered valid (as long as they meet the requirements below). You don’t have to be re-baptized if you convert to Catholicism from another denomination. Martyrs are considered “baptized in blood” and have all their sins wiped clean at the moment they die. If a person dies before they could be baptized, but they truly desired to be baptized, that’s good enough. While infants are usually baptized by a priest or deacon, anyone–even a non-Christian–could baptize a person, especially in an emergency situation, and it would still be considered valid as long as they followed the guidelines below. Also, in most cases, you will also need at least one consenting parent or legal guardian, reasonable assurance that the child will be raised Catholic. Catholic godparents, special clothes, candles and oil are all customary as well, though not required. Who: Anyone. Babies born into Catholic families are generally baptized as infants (from birth to 3-7 mo). Children over 7 years and adults are baptized upon conversion and completion of a training class (RCIA). Where: In front of the church. When: Typically on Sundays. Either during mass or after mass as part of a private, family-only ceremony. The priest, parents and godparents make the sign of the cross on the baby. One or two Scripture passages are read. The baby is baptized in the name of the Father, Son and Holy Spirit by immersion, pouring or sprinkling (Any method is fine. Immersion is rare, but it isn’t unheard of!). The baby is anointed with oil. The priest blesses the parents. The baptismal certificate is filled out and filed. Unlike the Protestant practice, which is pretty informal and doesn’t take more than 5 min at most, the Catholic practice is generally quite long and formal. You can find a detailed description here: Rite for the Baptism of One Child. Information about the symbolism of the various parts here: The Symbols of Baptism: How Do They Work? And a personal account of one baby’s Catholic baptism here: Blessings Abounded at Our Baby’s Baptism. Catholics believe that baptism washes away the effects of original sin. By washing away original sin and since babies are too young to commit personal sin, a baby would be guaranteed salvation were he or she to die young. The Church sees no good reason to withhold the graces or to wait. Protestants will say that baptism should be a personal choice, but Catholics counter that with a couple arguments. The best one is probably: Say your baby was sick and dying and you had a vaccine that would cure him. Would you wait until your baby was old enough to choose? Or would you, as the parent, make the best choice for the child, considering the grave consequences? Why Do Catholics Believe Baptism Removes Original Sin? The concept is also expressed in the Nicene creed, which states, “I acknowledge one baptism for the remission of sins” (I believe some translations say “for the forgiveness of sins”). But the Bible Says People Have to Become Christian First! Where? The Bible gives several accounts of people who gave a profession of faith and then were baptized, but the Bible gives accounts of a lot of different things (David committing adultery and murder, for example). There is a difference between telling what some people did and giving direction about what we are supposed to do. Also, you must remember, Christianity was a brand new religion when the Bible was written so more people were converting in than being born in. AND the Bible isn’t an all-inclusive manual to Christianity. Just because it doesn’t include something doesn’t mean that it did or didn’t happen. That’s why we have to turn to church history to fill in the blanks. So What Did We Ultimately Decide? Like I mentioned in the introduction, when our first son was born, my husband and I had a choice to make: Would we baptize him in the Catholic Church or not? Here’s what we decided. First, we met with a priest to learn more about Catholic baptism. (I believe this was a requirement?) It was during this meeting that I first learned that the Catholic Church believes that baptism washes away sin. This was news to me! After about an hour in the church basement, they sent us home with a pamphlet. Over the next few days, I poured over the pamphlet and the Scriptures. At first, I found plenty of verses that seemed to support my (Baptist) position. Then, I found quite a few verses that seemed to support my husband’s (Catholic) position. I wasn’t completely and utterly opposed, but I definitely wasn’t convinced. I told my husband that I had some reservations about baptizing our son in the Catholic Church since I didn’t wholeheartedly agree with everything the Catholic Church teaches that that meant, BUT that I would let him make the decision as the spiritual leader of our family. Whatever he chose, I would support. Personally, I think if the early Christian church can get along–we should be able to too. While I don’t see anything wrong with being baptized as an adult, I also don’t see any good reason to wait either. I’d love to hear your thoughts though! Leave them in the comments section below! What an amazing way to baptize your son. That is what it’s all about, when the holy spirit just guides you to making a decision such as that. Amen! I wouldn’t recommend it to everyone–there definitely are benefits to having a whole ceremony with the church–but it really was what was best with us. And it makes a cool story! Interesting stuff. However, I must say that according to the church anyone can do a baptism only in cases of necessity such as impending death. 1256 The ordinary ministers of Baptism are the bishop and priest and, in the Latin Church, also the deacon. In case of necessity, anyone, even a non-baptized person, with the required intention, can baptize, by using the Trinitarian baptismal formula. The intention required is to will to do what the Church does when she baptizes. The Church finds the reason for this possibility in the universal saving will of God and the necessity of Baptism for salvation. Yep! We found that out after I published this article, lol. Working to remedy that soon! Wow, this was an incredibly thorough and well researched post, free of rants and judgement. You did a great job of comparing the positions, adding historical facts and beliefs and presenting your story! I was raised in a reformed presbyterian church that believes in infant baptism. I was baptized as an infant and so was my husband (from the same denomination). We met and married in the same church. When our daughters were born, we had them baptized as infants there because we were members, even though we were then leaning toward believer baptism. He and I were both baptized a second time as adults and made a public profession of faith and I hope our daughters do the same some day. Although I don’t believe baptism is necessary once (let alone twice) for salvation, since it’s a command and Jesus did it, I think we ought to also. I DON’T think it’s something Christians should fight about though, I totally agree with you on that! Thanks for sharing, I’m looking forward to reading more of your posts! I just came across your post. I completely support the decisions of anyone choosing to bring their child up with a religious background. It was a great compromise that the two of you came up with. I myself was raised Catholic and also never completely agreed with everything that I was taught. But I think that is ok. I feel it’s most important to be a good, generous, kind person. The truth is, we really don’t know if there is a right and wrong religion, and won’t know until we have the chance to ask for ourselves. The best we can do, is the best we can. Ultimately, no one will be standing there defending our actions, except ourselves. Brittany, this is a well-written article, and I liked that the two sides you present are laid out in detail. I don’t agree with the Catholic view that infant baptism removes original sin (even though I suspect this is the view in some Protestant denominations too), but, just to share my experience, I’ve been on the fence in regard to believer’s or infant baptism for a long time. I grew up Baptist, and the Baptists can say with some reason that there aren’t really any definite instances in Scripture of infant baptism in the New Testament church and that most Scriptural commands regarding baptism are coupled with additional instructions such as “Repent!” that would indicate conscious decision-making on the part of the person being baptized. Those two facts point away from infant baptism. On the other hand, I’m now a member of a theologically conservative Presbyterian church, and this type of Presbyterian church ties baptism in not simply with the New Testament but also with the Old. It argues that baptism is similar to Old Testament circumcision, an outward sign of a covenant that God has established with His people. I’ve not studied infant baptism in detail, but it does carry weight with me that almost all major strands of Christianity in history (Protestant, Catholic and Orthodox) in their studies of Scripture have ultimately decided to at least permit infant baptism. For me, I believe that baptism is commanded in the New Testament one way or the other, and I’ve already been baptized. Should my wife and I be blessed with children, I guess I’ll then have to make a more firm decision on whether I still adhere to believer’s baptism as I did growing up or whether I fully shift to the sort of infant baptism practiced in the church I attend. I completely understand your perspective, being raised Baptist myself too! And I can definitely see logical arguments on both sides. I have heard the NT circumcision debate too, but decided not to include it just because I see too many loopholes in that too. I haven’t really researched that argument enough to be able to properly defend it or know if it’s true. Either way, I figure with this, neither one is wrong, and better safe than sorry! I know. I was really hoping at least one person would respond, and then it turned into a whole huge discussion. Very fun and informative! Thanks for helping!! Brittany, Thank you for sharing. Your post is insightful, loving and unbiased. I was baptized as a child but committed as a believer baptism in my new church. I love seeing the different viewpoints and beliefs of a group that ultimately is all working to be more like Jesus. Thank you for sharing, hopefully this will shed some love and grace on our differences. That’s my hope too. Not only with just this post, but with this entire Catholic/Protestant series. I don’t care which side people take, or even if they take a side at all (I haven’t)– I just want people to be informed in whatever they do decide. It’s been a lot of fun, and we’ve all been learning a TON! Well, not necessarily. How do we know that ANY of them are 100% right? I would be more inclined to believe that all of the denominations vary from 20-99% right — (those numbers are completely made up) — because can we ever be 100% sure that any denomination has everything all the way right. And then, when trying to figure out which is the MOST accurate–well, I can’t really know until I thoroughly research. Maybe Catholicism has some belief I haven’t uncovered yet that is totally, completely off? I won’t know til I research more. And I wouldn’t agree that just because something isn’t 100% correct, it’s all a lie. It depends on which part is correct. If it’s just some tiny detail the Catholic Church got wrong, that won’t make a difference. If it’s a core belief, then that’s a problem! I think an important part to consider is the fact that God can neither deceive nor be deceived, And He would not leave us floundering so much , in a 20-99% margin 🙂 He said he would be with us. As for core beliefs, only one church has held the same beliefs since the time of Christ and the apostles. And has survived despite the frailty of man. And as you have found, so many Truths from the early church fathers and their practices., are the same truths the Catholic Church teaches today. I don’t mean that God is responsible for the 20-99% margin. I just mean that I think God would allow a slight margin for error without bothering to come down and fix it, and I’m currently trying to decide which set of beliefs is the most accurate. Catholics say that their beliefs are the same, but are they? (hypothetical question) The undeniable truth is that being Catholic today and being a believer in the first century is never going to look the same. Adaptations had to be made. That’s not a bad thing. Just something to sort out. How much have we all changed? Who is most accurate? That’s a tricky question. I have a question. When Jesus was on the earth did He not create a church or did He create a religion? If He created a church that still existed today wouldn’t that church be 100% correct? Um… I’d say that’s more a matter of semantics, and if we were getting super technical, he didn’t technically create either. Instead, he taught his closest followers (the apostles), who turned around and taught others, who turned around and taught others. And it wasn’t long before they thought it best to organize themselves into a church and start writing things down (the Bible) so that they could better keep the religion from error. After all, it was all word of mouth in those days, and the people were so far spread with limited communication, so it would be very easy for messages to get lost in translation. (They weren’t – we have very early copies of the Bible that confirm that our Bible today is correct, so no worries there. But part of that is because the church organized so early). As to whether or not a church would be 100% correct, the Catholic Church believes that this is the case and that they are it. They believe that, in the same way God was able to divinely inspire the writing of the Bible, to make sure that only the right things were recorded, that He also divinely protected the church from doctrinal error (not ALL error – they are humans. But from *doctrinal* error). Personally, I do believe there *could* be one denomination that has it 100% right. It is possible. BUT in order for me to know that a church is 100% right, I’d have to know 100% myself in order to be able to judge that. And I just don’t think it’s practically possible for me, as a human, to be able to declare something 100%. I can know a lot. I can clearly see that some churches are closer than others. But for me (or any of us) as humans to be able to say with 100% certainty that a church is 100% correct? That just seems prideful to me. As though we know everything. So I typically just take the angle that we’re all off a bit somewhere, and we can ALL stand to learn and grow. And the more we do that together – by discussing our differences – the more we can ALL learn and grow closer to the truth, whatever that is. Personally, my theology runs fairly Catholic these days, but culturally, I’m definitely non-denominational. It’s a weird mix. So I know *I’m* not 100% correct! lol. But I’m growing and learning every day. Sorry, that’s a long answer! You’re right. No one can know everything about God except for Him. We should just try to learn as much as we can in this life. Thank you for the response. I had another question about the Pope. What role does He play in Catholicism? I know he is the leader, other than God, of course, but how does he “make the rules”, or does he preach doctrine instead of making it? I appreciate your polite comment but the reason for your not believing in Infant Baptism has no basis in either the Bible or the early Church tradition. Neither of your two points “[baptism] is an outward sign of your inwards belief” or “acceptance of Jesus Christ as your Lord and Savior” are in the Bible. Neither can be found in the early Christian faith. Both would be excellent reasons for an unbaptized person to be baptized. Both inwards belief and acceptance of Jesus Christ are excellent for every Christian to have. Requirements for baptism however, not biblical or traditional in any way. The two phrases are an example of how ministers continue to splinter Christianity into thousands of little groups, especially non-denominational ministers who want to fill their seats and their stomachs. I don’t think that either infant bapism or believers baptism is absolutely correct and the only right way. It really depends on the situation and it’s definitely not something Christians should be fighting about. Does that mean that your kids only go to a Catholic church on Sundays or do you switch Baptist/Catholic? Could that work if you were still a devout Baptist and if you strongly agreed with all of the Baptist teachings? Hi, Sara (sorry for the long delay in response!) The concept of the husband being the spiritual leader of the home is not a Protestant/Catholic one, bt a very traditional Christian beieve. I tried to find a good article, but couldn’t find anything really good. In traditional Christian belief, this does NOT mean that the husband is the supreme ruler of the home and can do whatever he wants while the wife meekly submits and has no say. Instead, it is taken to mean that the husband is responsible for the spiritual state of his family as the guider, overseer or ultimate decision maker, if it comes to that. In our family (we’re fairly traditional without being terribly old fashioned), it means that my husband asks for and values my opinion on things, but when we can’t come to an agreement, I generally let him lead, since when we reach Heaven someday, he will be responsible for our family. To answer your second question: we go to Mass every Sunday and my children go to Catholic school. I was raised Baptist, but I never actually considered myself to be any denomination, just “Christian.” I’ve always told my husband that I didn’t care where we went to church–Protestant or Catholic–or long as they taught the essentials (Trinity, Jesus born, died rose again, possibility of Heaven someday) and the congregation wasn’t dead. I wanted someplace with a “go out and serve” focus. While I haven’t always agreed with every single thing the Catholic Church teaches, to me, it’s just the smaller details I’ve had a problem with. They still teach the essentials. And it helps that they have a great school and a missions focus. It’s not necessarily my first choice 🙂 but it’s what is truly best for my family as a whole for a lot of reasons. Just check the “influence of parents” chart. I found it really interesting how the father’s church attendance influences the children much more then the mother’s. I have another question: do your kids have godparents, since they were baptized at home? That chart is so interesting! So kids do better when the mother ISN’T religious? weird! I’d love to see a chart where they break it down further by gender. For example, in my family, my mother was very dedicated, and now so am I. My dad attended but wasn’t so “into” it, and both of my brothers are the same way. And no, they don’t have godparents. But the person we had discussed naming them would NOT be a good choice any longer, so… dodged that bullet? I was surprised too, especially because most people I know who go to church grew up in families where both parents attended regularly. Although some people feel like their parents pushed them too much so later in life they don’t want anything to do with church. Maybe that’s part of the reason. It would be interesting to see a more detailed description! But your kids will need godparents for Confirmation (if they’ll go) so then they can choose someone for that role. I don’t have godparents, so it was never a concern for me, but yes, they’ll probably get them at confirmation. That’s a good idea. Am a catholic christian and this is like a general rule,Husband is not only the spiritual but overall leader of the Family. The husband takes overall responsibility .Its Biblical too.1 cor 11:13 ,7. Another great post! Congratulations on your good news! Just a couple points to add and clarify. First, with Baptism of Desire – it’s not just the person chose Baptism but hadn’t been given the opportunity yet. It also covers those who would have chosen baptism if they were fully aware of it’s importance. As I’ve said before, God has bound Himself to the Sacraments, but He is not bound BY the Sacraments. Second, the most common time for non-infant baptism is Easter, especially the Easter Vigil Mass. The type of baptism (trickling of water, immersion of just the head, full immersion) depends on the parish. Some parishes have baptismal fonts which allow for full immersion, while others only allow water to be poured over the head. Third, the Sacrament of Confirmation is not something that was “added” but rather was separated. Originally, people were baptized and confirmed at the same time. But after awhile this became impractical because bishops could not be at every baptism. They would come later and perform the Sacrament of Confirmation. It wasn’t until Pope St. Pius X that the current order of baptism, first communion and confirmation was established. In the late 1900s (about the time of Vatican II) priests began performing Confirmation because most RCIA candidates were being baptized and confirmed at Easter Vigil. The bishops couldn’t be at every parish on the same day, so priests began accepting more responsibility for the Sacrament on their behalf. Lastly, the Church doesn’t teach a person doesn’t have to be re-baptized. The teaching is a person CAN’T be re-baptized. If you’ve already had one valid baptism, a second is both unnecessary and a sin against the Holy Spirit. By seeking a second baptism you’re saying the first was somehow invalid or insufficient. Re: “It also covers those who would have chosen baptism if they were fully aware of it’s importance.” I had not heard that! Hi Brittany! I am a Catholic covert of 5 years as of this Easter. Truly by God’s grace have I found my way home! I just wanted to express my concern for your Catholic husband baptizing your children if there was no imminent fear of death and for the priests to not have educated you in reporting it and having the other ceremonies of the rite supplied. As a Catholic you can’t just baptize your child in your living room on a towel on a whim. Sacraments are holy and should not be entered into lightly. I agree with Margo. Jesus didn’t leave us with 40,000 plus truths. There is only one truth and may the Holy Spirit guide you to it! God bless you! This is such a wealth of information! Thank you for compiling it all! I was baptized as an infant in the Catholic Church. Later, after falling away from the church for a time in my late teens/early 20’s, I felt compelled to be baptized again, in a Baptist church. Now, nearing 40, I’ve been a confirmed and practicing Lutheran for over a decade. I don’t believe that either practice is wrong or sinful, but God has recently revealed to me that I received a gift through my infant baptism and that the Holy Spirit held me close through my wandering years because of it. I think you did a great job laying things out in this post.I enjoy learning what Catholics believe.. I would say the baptist way is most biblical.I see over and over that it is believers getting baptized and not babies.I don’t see any examples or anything telling to us to do so.If babies need to be baptized to be saved then what happens to the ones who do not get baptized?Then also now if they can grow up and never hold to any faith then the baptism did nothing for them. If we are saved by God’s grace alone apart from works then baptism would be something one would have to do before God “could” save them..
As for the one “baptized in blood”. Could a Muslim, who holds to a false belief of God be saved while denying the one true way, but was a martyr ? thanks so much. You are putting in such good work in this series! Thanks for letting us all benefit from your studies. I am coming from a life-long Catholic background, so keep that in mind. I have always wondered why Protestants seem to minimize the importance of baptism. Even in your article and others’ comments the concensus seems to be, “Well, it must be important since Jesus told us to do it.” However, the sinner’s prayer seems to be the protestant equivalent of the Catholic’s view of baptism as the emphasis is placed on that declaration of faith, and the baptism as a nice little follow up that you get to eventually. That doesn’t make sense to me. At the very end of Matthew’s gospel, the very last thing Jesus says is” Go, therefore, and make disciples of all nations, baptizing them in the name of the Father, and of the Son, and of the holy Spirit. teaching them to observe all that I have commanded you. . . ” (Mt 19-20). The very last command he gives is to baptize and to teach. He doesn’t say, go therefor and make sure everyone accepts me as Lord and Savior. Also, he says to baptize them and teach them. So there is teaching going on AFTER the baptism because though one commits to Christ, conversion is a continual process. Also, simply, the bible doesn’t say anything against infant baptism. It seems to reason with the number of people converting through the apostles’ teaching, that the issue would simply come up in scripture. We see Paul do this with another great sacrament, the Eucharist, where he warns about proper admittance to the sacrament and warns against “eating and drinking unworthily.” He talks about marriage. He talks about head coverings, for goodness sake. If infant baptism was an improper application of the sacrament, I can’t imagine Paul would remain quiet on the issue. Hey, it’s a great benefit to me too! I think the reason is because so many verses say “repent and be baptized” together. Protestants believe the forgiveness of sins happens at the “repenting” half of that equation (often through the sinner’s prayer), while Catholics believe that it happens at the “be baptized” part. Time and time again you see both together. Both sides think both aspects are important, they just emphasize different parts. It’s kind of like the question “At which point does the Eucharist turn into the Real Body and Blood?” Well, it’s not like you’re just going to do just that part, so the question doesn’t really matter, and yet we like to define the exact when. If that makes sense? Since we are saved by grace and not works (Eph.2:8) We don’t want to change the Gospel into things we must do to get saved.We are told “Believe on the Lord Jesus Christ and you WILL be SAVED.”There is a promise here. Believe and you will be saved. Not here is the things you must do and keep trying and you might be saved. I don’t believe in a sinners prayer in the sense you can say a magical prayer and live any old way you want and your “saved”. That is not biblical. Man does not seek God,want God or can come to Him without being drawn. (Rom 3:10-11,John 1:13,1 Cor. 2:14,John 6:44)God opened my eyes, I saw that I was a wretched sinner that could not add anything to His Grace.This is conversion. Then the first act of obedience was to be baptized. This represents the old man has been buried and now risen with Christ. My life has been changed radically.I have the Holy Spirit, Christ died for all my sins and I have salvation. Salvation is not a continual process. Math 28:19 “Therefore go and make disciples of all nations,baptizing THEM in the name of the …. Who do we baptize? The unsaved or disciples? I see disciples here and the others in Acts. also. Jesus in John 3:3 says we must be born again. This means :born from above” when we are,we have life and the old man is gone and the new one has come. You are adopted and sealed and forgiven as far as the east is from the west. Paul says in 1 Corth. 1:13-17 that He did not come to baptize but to preach. He did not see salvation depending on baptism. That is why we don’t see any commands to do so FOR salvation. Not abrasive at all and I 100 percent see where you are coming from. I grew up believing EXACTLY the same thing. But after all those verses I came across in my Is Faith Alone Enough Post, I have to admit, there certainly are plenty of verses that suggest that simply believing and then going about your day isn’t enough. So yes, your verses support one way and these support another, but you have to take them altogether as a whole. Do I have any idea how it all works? Not at all! I know we cannot possibly EARN our salvation. It is ONLY through and because of the grace of God. But in light of these verses, I have to believe that works have to play some role somehow. And I would classify the Eucharist, Baptism, etc under that. Not what saves us–Christ does that–but they are important and they must play some part in the whole thing somehow. Thank you so much for taking the time to post this series. I’m in the same place at the moment….born and raised Baptist but married into a Catholic family…and I’m working through the same exact issues. In fact, I just called my husbands church today to make an appointment with the priest to discuss my faith journey. Thank you again. This was such a help! I have recently returned to the Catholic Church. I am getting our kids baptized but the whole Godparent thing has been as issue. I could go into more detail, but this isn’t the place. Did you find anything about Godparents in your research? I haven’t looked into it too thoroughly yet. Is there a particular issue or concern you have? I’d be happy to look it up. Wonderful website. Thank you for all your hard work and dedication to the research, in creation and maintenance of this gift to Christians everywhere. One positive criticism in regards to the above article on Baptism: omission of the Gift of the Holy Spirit. This is a HUGE part of the teaching of the Catholic believe in Baptism as a Sacrament of God yet receives little to no mention in your article. The gift of the Holy Spirit is for all who are baptized and significant. The gift of the Holy Spirit is mentioned in your own biblical quotes above: Acts 2:38-39; John 3:5; Titus 3:5. It is also one of the main reasons to baptize infants…you want them to receive God’s presence and power and life. You want the babies, children to have every benefit that God gives as they grow and mature. Please edit/add this important teaching of the Catholic Church to your article on Baptism. Again…THANK YOU for a wonderful website. Keep up the great work! Thanks, Fr. Joe. That’s a very important point too! No matter how ridiculously long these articles get, there’s always more that can be added!! As a born again Catholic, smile, i really appreciate the effort to explain what Catholics believe and to do so in a very loving manner. In John 21,25 it states that not all Jesus did could be written down. If it were the earth could not contain all the writings. This passage, shows the importance of Apostolic Traditional teachings that the church offers. While the bible is important, it dosent contain everything that jesus taught his apostles. This knowledge was handed down to our current priest and bishops. If you attend mass daily, in 3 years, you will have had the entire bible read to you by the priest. The same readings that are read daily in mass are the same readings read in every catholic church throughout the world on that day. The one thing that most people I think have a severe problem wrapping thier heads around is that Dogma…Religion…etc are not faith. Practices, traditions, interpretations and all of the various things that “define” one sect of Christianity from another are simply the wrapping paper for the idea contained inside. Too many people wear a jersey or colours and stand proudly and say “My Faith is the Only True way of seeing this”. It all gets very narrow and prescriptive and in the end there just stands one thing. What does it mean to YOU…and only YOU. Some find Catholicism as being what chimes most with them…some find the Baptist way of doing things as being proper, others lean towards Evangelical and the myriad of other ways of getting to Jesus as what resonated most with them. And in the end that is the basis of this tribalism…you have to stand up for your own way of doing things because to accept any other way means your way might not be correct!!! In the end many cant find peace with there being an alternative, because they NEED to be right. But in the end it is all entirely SUBJECTIVE and PERSONAL. You can not in any way force somebody to accept your interpretation of what is correct…simply because it feels right to you and you are unable to simply live and let live. The beauty of faith is that it makes YOUR life better…YOUR world brighter and brings peace to YOU. How you find it, and what you believe is sacred to YOU. The different denominations matter little…once you find one that rocks your boat just leave the dogma and tradition and all the trimmings of somebody else’s practices alone. They don’t harm you in any way…other than to make you doubt that you might be on the right path. In the end that’s on you…your doubts are your own, not anybody else’s. So don’t make them any body else’s problem. If what you believe chimes with you…allow what the fact that what chimes with somebody else may be different, but no less integral to them and their sense of joy or peace in the world. Thank you for you thoughts, but I must respectfully disagree. While some matters of faith are matters of preference (like music style and what we should wear to church), many things really aren’t opinions at all. For example, either baptism is good for the salvation of the soul or it’s not. Either the Eucharist is the true body and blood of Jesus or it’s not. Whether you and I agree on these matters really has no effect on whether they are true or not. They either are or they aren’t. My purpose here isn’t to make everyone think what I think, as though my opinion is worth more than anyone else’s, but to open up a discussion so people have the information they need to make an informed decision that’s as close to the real truth as possible. Hope that makes sense. Well it seems we must respectfully disagree with each other. I think you see the world in the way that many fundamentalists view it. Through the eyes of absolutism. For what is Truth??? Is it an absolute thing that exists outside of the observer or is it a relative thing that exists within the relationship one hasI think from what you are saying you hold Truth like it is an absolute, immutable and exists outside of you. But if that is true then no part of the Holy Spirit can be a part of you. If you are not part of it then no relationship exists. I have a relationship with that and it brings joy to my life. You have a relationship with it, and it brings joy to yours. But it is not Absolute, because our relationships are different. But if you are seeing it as an Absolyute, then are you not simply observing it and not letting it in. Relativism is sharing yourself with something and becoming a small part of a larger whole defined by relationships where no absolutes exist…and seeing that absolutes are simply the construction of a mind that can not comprehend that is limited and needs to create its absolute world based solely on its relationship in order to feel that their version of the Truth is unassailable. And to such people absolutism is all the have, so its probably better that I save my breath to cool my porridge so to speak. But think on this…no absolutes exist anywhere in nature. Neither in the cosmos nor in time nor space. God created this world built solely upon relationships where absolutes are imaginary and born of isolated thinking in an isolated fashion. He created a wonderous world and all it contains solely on the premise of relativity…..where absolutes do not and can not exist. And I know you will probably tell me that God exists outside this world and His being the sole Absolute but honestly, if He was that way, if He wanted the world to be that way….He would have made it that way. He made the world and everything in it in His own image…and no Absolutes exist. Only relationships…and mine is very wholesome and brings light and joy to my soul, as it does for my parents, and my siblings and my family. So can it be wrong? Only in an Absolute world can it be so. Therefore I must respectfully conclude that it isnt worng…its very much right, and QED, an Absloute Truth does not exist, because not everyone who believes can agree, and its not about agreeing that one way is right and another way is wrong, but agreeing that what is part of the Human soul that is joyous and gentle may experience its own Truth, but it is part of a relationship of all the souls which have ever lived, all bearing witness to the fact that God is part of all of us and exists only if the relationship is sincere and only because of that is it True. Thus Truth is Relative…and not Absolute. That kind of thinking doesn’t even make sense. Yes, there are plenty of things that are relative (such as the best way to respond to different situations), but there are also tons of things that are absolutes. For example: Is there a God or not? You can’t have both options. There either is or isn’t. Is the Eucharist the body and blood or not? It either is or isn’t. Is the device I’m typing on a computer or not. My relationship with it has absolutely zero effect on what it IS. Well let me say this then. What IS. I am a Catholic. I was baptised as a baby, took Communion and Confirmed the vows my parents and Godparents made at my baptism, and I have tried to follow my faith in as much as I can. I was also brought up to respect the fact that my faith was personal, and not necessarily the way any other person views theirs, because everyones relationship with God and Jesus is different. If somebody else, such as yourself believes certain things and it works for them, then allow them as long as they arent forcing their views on you. Becuase that relationship is theirs and yours is yours. And all i was trying to point out was that. Relationships matter, and relativity is actually more prevalent and inspiring because it allows for and caters for something uniquely Human. Life. Experience. The chaos of circumstance and chance. If you were born in a different country, say the middle east…you would probably be running a website praising Allah and his prophet Mohammad…quoting the Quaran and walking 5 paces behind your husband with your face covered according to Sharia Law. That you are not, and that you are who you are is totally circumstantial…that you believe what you do is equally circumstantial. However…that you question or query any one elses way of doing things isnt. That is a choice. That is a conscious decision to profess that your beliefs are paramount and somebody elses may be questioned. Because..who cares what Catholics do? Who cares what Baptists or Evangalists do? Why even be bothered or seek to put an opinion out there? Oh yeah….it bothers God apparently. So is passing His judgement the sole bent of the puritanical Christian? Let me tell you a story. My mother was deeply religious and held a great faith in her Catholic upbringing. She attended mass every Sunday with us and her own mother, another deeply devout Catholic. When I was 12 or 13 I was finding the whole mass thing rather tedious…this whole Jesus and God thing was a bit of a questionable affair. I told my mum…and in her kind way she said this. You are young…you dont know anything about life or living yet. You live under the protection of your dad and I. But dont discount faith. Dont discount its worth and its protection. You are at an age when identity, self awareness and who you are and what you stand for are all shifting and chaotic. But son…just promise me one thing. Find something. Find faith. If its not Catholicism…even if its not Christianity…find something that means something to you. Only when you can sincerely say that this brings you peace, and helps you to be strong, to live a good life and embrace others and embrace life will you know what is True. You cant hide from your soul…it belongs to something bigger and wiser and greater than you. Only when you find it will you be all you were meant to be. And you know what? That took guts. That took love. That took seeing me as her son and showing that she knew me, she loved ME. Was she wrong in your eyes for doing that? Or should she have rammed her faith down my throat or brainwashed me with endless quotations, an US vs THEM mentality, the fear of hell and damnation, just so we would believe what she did? When she was diagnosed with cancer, a brain tumour that she fought for 2 years even thought the doctors gave her less than 6 months she gained so much strenght from her faith…her personal faith and relationship with God. When all of us were full of pain, worry, sorrow…she was full of her faith and strength and she held us all together with her simple dignity and love. She never wept, never lay in bed all day feeling sorry for herself, never gave up and to this day that woman and all she was, all she is and will remain in my heart showed me the true meaning of faith. Not in words. Not through force or deception or fear. Just simply by being who she was, and all that her relationship with God meant to her. There were no miracles. No interventions. Because that isnt faith. And it isnt a bunch of rituals or following the bible to the letter either. Its deeply personal. Its deeply Human. And that is the Truth. But according to you…and those like you there are only 2 types of people in the world. Those that believe as you do…and live the bible in a puritanical fashion and denounce pretty much everything else…and the rest of us sinners simply because we dont see the world as you do and thump our bibles at every given opportunity. So. Please answer me this. Is my mother in heaven…or hell? Because she was Catholic, devoutly so and believed with all her heart in the sarcaments. Because she was blessed by her parish priest and given the Last Rights in front of all her loving family. Because she said the rosary every evening with her mum, and said our prayers with us every night before bed, including the Hail Mary which she always started with. In doing all of this, and in encouraging me to find Truth for myself was she blaspheming and sending her soul and my soul to eternal damnation? In her befriending and having deeply fulfilling friendships with Christians, Protestants, Athiests, even a Muslim or two and never once questioning their faith or even bringing it up in conversation because it truly didnt matter…was she living an unrighteous life, a lazy life not in full service of the Lord, and cavorting with evil? In not living her life to the letter of the bible and not being completely puritanical in her thinking and her living is she now a lost soul? And please…answer honestly, according to your views and what you believe. Tell me what IS Absolutely the truth in this….according to you and your beliefs. Tell me what IS. I'm at the moment a Christian and have been my whole life. Like you I was raised and taught to believe that if you believed in Jesus and that He was the Son of God and died for our sins then we would be saved and have eternal life with him. I was baptised when I was a baby but then made the decision to be re-baptised as a teenager. My brother who like me has been brought up as a protestant, is very knowledgeable in God's word and has started questioning our beliefs and has been working with a Catholic Priest for sometime now t nut out all of his questions and compare beliefs against scripture etc. And he has told me he is just about ready to convert but still has a few points he needs clarifies to make his decision. Anyhow, it was him who passed on your blog address to me and after reading it and speaking with him, I too am shocked to see that what the Catholics believe has quite a large amount of scriptural ground and it just makes sense. My question in regards to this post (and I haven't read any of the other comments as there are so many so I'm sorry if this has already been discussed) is what about children who are conceived but are lost due to miscarriage? Does their fate come down to whether or not their parents were baptised and followers of Christ? This to me just doesn't make sense. Why would God create a precious child in the womb only to take he or she before she was born and not have another purpose for them? Surely God who I know to be loving a God wouldn't do that (though I am new to all this and could be wrong). I also don't understand why he would create a child, who may be born but die not long after or in early childhood, and condemn them to hell because their parents didn't believe or have them baptised. I know the Bible says that no one knows the mind of God but is there any light to be shed on these points? And on another note, if I was to decide to convert and become Catholic, would I be allowed to be re-baptised as what I was lead to believe as a teenager about being baptised is very different to what the Catholics teach. If I were I feel it would be a really special thing to do. Thank you so much for sharing your journey with us all. I'm only up to this post so far and I know you wrote then a year or two ago so I would be interested to know if you came to a conclusion regarding your faith or if you're still searching for the truth? Oh my goodness I called you Bethany haha I’m so sorry. I was thinking about another Christian woman who is called Bethany at the same time and am following her journey too. I’m not entirely sure what happens to miscarried or aborted babies, but I did a little research and apparently no one is really sure as the Bible and church tradition don’t explicitly say what happens. Limbo (that they don’t go to Heaven or Hell, but just sort of hang out in between) has been mentioned as an idea, but there is no official belief. Catholics do believe in intent, meaning that if a living person wishes to be baptized but dies before they are able to, the fact that they wanted to and would have if they would have had the chance should be enough (I belief). Here are two articles I found, but you should probably speak to a priest for more info. http://catholicherald.com/stories/Straight-Answers-Do-Aborted-Children-Go-to-Heaven,6744 and http://www.ewtn.com/v/experts/showmessage.asp?number=377640. As to getting baptized yourself: When I was asked if I needed to be baptized again, they said it was unnecessary and a Protestant baptism counts. You would have other rituals you go through, namely confession, which is kind of like the Catholic equivalent of the Protestant baptism. But, even if it’s not needed, I don’t know if you could request it. You would have to ask about that too. And as far as myself: I’m still stuck in limbo over here too. Learning and reading a lot still, but haven’t been fully convinced yet. Everything I wrote in this series is still my beliefs. Hope you find the rest of it helpful and let me know if you have any other questions! I appreciate your thoughts on this, as I too have struggled with what God says to us about baptism. I was baptized and raised in the Catholic faith, married a WELS Lutheran, and shortly after marriage joined the Lutheran church. Our kids were baptized as infants, but then later in life I had a falling away from the faith (through my involvement with yoga and new age beliefs being presented). Thankfully, the power of Christ brought me back to faith because, after all…through my baptism, I belonged to Him! I’m not sure why I wrote this, except maybe to convince myself of what I still believe. In my studies today I was examining different viewpoints on baptism and came across your blog. It still remains a bit of a mystery to me. Oh, and I did not get rebaptized because after much prayer I was led to Acts 10 where the Voice says to Peter “Do not call anything impure that God has made clean.” That solidified it for me…the mystery of faith…the new creation I was in Christ was because He had already cleaned me at baptism. I was just growing up in my salvation! God bless! You are not wrong. God is a fair and a just God. He would never condemn his children to hell knowing that they did not know the truth. That would neither be just nor loving, which would defy his purpose. God’s work and His glory is to “bring to pass the immortality and eternal life of man”. Those who are innocent and do not know right from wrong i.e. children, people with mental disabilities etc. will not go to hell. In fact, they go straight to heaven. I hope that brings you comfort. As a child I was baptized I was 7 I grew up and accepted Christ as my Lord and savoir .I was annotated I do not feel the need to be baptized again . If you were baptized before, there is no need to be baptized again. It counts. Hi Brittany, I’m just starting to get to know your blog and I appreciate all of your thoughts and research. My roots are in the Restoration Movement, also known as the Stone-Campbell Movement, which began in the 1800s and was originally a call to pull all the denominations back together (sadly, it is a very splintered group today). It’s interesting because these churches don’t really fall into either of these categories when it comes to baptism. Most Churches of Christ, Disciples of Christ and certain Christian Churches with their roots in this movement believe that while baptism isn’t necessary for infants because they are not accountable for their sin (although we are all AFFECTED by original sin), the Christian is converted AT BAPTISM rather than before, when he or she is old enough to repent and make a faith decision to make Jesus Lord (Romans 10:9). They are old enough to make that decision when they reach what some call the “age of accountability” or old enough to “choose the right and reject the wrong” (Isaiah 7:15-16, they also refer to Ezekiel 18 to refute the idea of original sin). Anyway, they cite early church writings to support this belief (within the first and second century BC, including the Epistle of Barnabas, Shepherd of Hermas, Justin Martyr, St. Theophilus of Antioch, St. Ireneus, Tertullian, Clement of Alexandria, Origen and more). Some of the core supporting scriptures include Acts 2:38, Romans 6:1-7, Colossians 2:12, John 3:5, 1 Peter 3:21, Mark 16:16 and a few more. Just curious if you’ve heard about this argument, as it’s kind of a “fringe” one (but in my opinion, very rooted in scripture). I’m a bit of a church history and doctrine geek so I’m excited to read more of your stuff! Yes, that “AND” is very important! I suppose many people spend a lot of time arguing about baptism details when perhaps repentance needs a little more attention! I think Dietrich Bonhoeffer discusses some of this in “The Cost of Discipleship” (a Lutheran perspective, incidentally, definitely a must-read—although you seem to know your stuff so you may already be all over that :)) I appreciate you approaching this issue with grace. Take care! Interesting post, I skimmed through it and will have to read through it more thoroughly once I get some time. I wanted to first say that I believe that you would find Catholic Moral Theology to be interesting as it elaborates deeply on these subjects; for instance, you will get into Baptisms through water, Baptism through blood, & Baptisms through desire. As to infant baptism via the Catholic view; There is no express mention of the baptizing of infants in the New Testament, but it is at least probable that there were infants among the whole families that were baptized by St. Paul (Acts xvi. 15; 1 Cor. i. 16). The necessity of infant Baptism follows from the fact that they have contracted the guilt of original sin (Rom. xii. 5- 19), which Baptism alone can remit (John iii. 5). The early Fathers are unanimous in insisting upon infant Baptism, basing it on the universal command of Christ to baptize all (Matt, xxviii. 19; John iii. 5), and on its divine power to cleanse from original sin. St. Irenseus (140-205) writes: “He came to save all who through Him are born again unto God; infants, and children, boys and youths, and elders” (Adv. Hcer., Lib. ii., ch. xxii.) Origen (185-255) declares infant Baptism an Apostolic institution (Epis. ad. Rom., Lib., v.. 9). and necessary to cleanse infants from their Original Sin (In Lev., viii., 3). St. Cyprian and the Bishops of the Third Council of Carthage (253) taught that children should be baptized as soon as possible after birth. Their Baptism was not to be deferred until the eighth day, as some maintained. This is (Epis., lix., 3-5), a faithful echo of the teaching of the Apostles, as St. Augustine remarked (Epis., cxliv., 23). The Council of Milevis (416) taught the necessity of infant Baptism, and this doctrine was repeated in the Councils of Fourth Lateran, Vienne, Florence and Trent. The words “unless a man” (nisi quis) allow of no distinction between young and old, they mean children and adults (nisi quis literally means “unless one is” or “unless anyone is.”). The Greek ἐὰν μή τις (eán mí̱ tis) means “if not anyone.” The term “anyone” would have no distinction between adult or child. Nicodemus saith to him: How can a man be born, when he is old? can he enter a second time into his mother’s womb, and be born? I respect the fact that you are devoted to your family and wanting to live the way you feel God wants you to live. I pray that you become enlightened about what the true Bible says. Water baptism is no longer a necessity. That was for Israel. Now we are under grace. We are now baptized by the Holy Spirit. Works without faith is dead. You do not get to heaven because you are a good person or because you go through certain rituals. You get to heaven by believing Jesus died on the cross for your sins. No more, no less. I encourage you to do your homework on the vatican. May God bless and keep you and your family. Interesting perspective — I’ve never heard that baptism with the Holy Spirit replaces water baptism. Do you have any good Scripture verses to back that up? I’d definitely be interested in reading more. The way you baptized your child is interesting. I have read from your research that Catholics believe baptism removes the original sin. I completely agree with that because I have read in the Bible that repentance is for the forgiveness of acquired sin and baptism is “for the remission of sins”, which I believe is the original sin. Regarding your baptizing your infant by yourself at home, I have reservations. Again I stick to the Holy Bible when I say this. I have not found any evidence in the Book of Acts or elsewhere that shows families baptized their infants by themselves. To the contrary, the Bible says there are people sent from God to baptize (1 Cor 1:17) In the Book of Acts where we read the practice of baptism, all baptisms were handled by the apostles. Yeah, what we did technically isn’t really “allowed” except in cases of emergencies, I guess… We did later have all three kids officially baptized in the church. As for infant baptism in the Bible – I’m torn. It does talk about baptizing whole households, which could include babies. But you’re right that it doesn’t say specifically. Another thing to keep in mind is that the Catholic Church does not go by ONLY what is expressly recorded in Scripture. They also look to the teachings of the early church for direction. (In other words, they follow both what the apostles wrote AND said). So, if there is very good evidence that it was common practice in the early church, that would be enough, even if it wasn’t explicitly stated. And lots of things aren’t explicitly stated in the Bible, and yet we believe them anyways. Like the Trinity, for instance. Thanks Brittany for your reply. It is really good to view things positively and that is what you did. Just like you and other respected people who posted their comments here, I am writing just to express my views and not to argue. That would still be the same with infant baptism though. My children were all baptized “in the name of the Father, the Son and the Holy Spirit” (or whatever exact phrase they say), as was I when I was baptized (I was in fourth grade and baptized by my own choice). I’ve only recently found your blog and so far I’m delighted to find someone who really tries to get to the heart of the matter! I grew up Methodist and was baptized as an infant. When we recently changed denominations to Baptist, we had to be baptized again in front of the church in order to join. I think you hit it just right! Neither one is wrong! We looked at our second baptism as a kind of reaffirming of our faith! It is a very different experience when you can make the choice for yourself! My name is Joseph and I’m 18 years old. You’re great for doing all of this research. God has given us the word and you’re taking full advantage of it. I just wanted to put my beliefs about baptism out there. I belong to the Church of Jesus Christ of Latter Day Saints (more commonly known as the Mormon church). We believe that baptism cleanses all previous sin. People under the age of 8 cannot be baptized until they turn 8 because that is the age of accountability (the age when you can know what is right and what is wrong). However, converts above the age of eight can be baptized no matter how old they are, and by doing so they become a member of our church. After that your sins can be cleansed by repenting and by taking the sacrament (this renews the covenants we made with God at baptism to keep His commandments and others) which we do every Sunday at church. We also believe in baptism by immersion and right after baptism by water we receive the “baptism by fire” (don’t worry it’s not real fire). By doing this we receive can receive the gift of the Holy Ghost and we can have him to always be with us as long as we are keeping the commandments and living worthily. I forgot something. We also believe that baptism must be carried out by the correct authority, that is, the priesthood authority which we believe is the power of God on earth. We believe that it was lost when those who had it, like the disciples were killed. We believe that it has been restored and only by this authority, which we believe is the same authority John the Baptist had when he baptized Jesus, can baptism truly “count”, which is another reason why converts must be baptized again if they have been previously. Thanks for sharing! Always good to learn more about what other groups believe! Awesome post! I thoroughly enjoyed the research that you did. I recently came across your post because I am starting to get into preaching with the church of Christ. I say that for your benefit. I think that all denominations are equall as long as you believe in Jesus as the savior and you take no other gods before God. Also I wanted to point out that sometimes we forget to include the Holy Spirit when discussion baptism and I feel that that is one of the best parts of baptism is receiving the Holy Spirit along with the remission of sins. I really came along to learn about other denominations because it can only be helpful with spreading the Word of God. Thank you for the research you did and your conviction to never rest in finding God through Jesus. Hi, Cameron! Glad you enjoyed the post! And yes, the Holy Spirit is essential! I don’t get it… Why are there prophets in the Bible but none today? Why did prophets suddenly stop being a thing? What makes you think there aren’t still prophets today? Nothing. Are there? Have you seen anyone giving public prophecy for the church?